After two days in Manila, we decided to head on up North to enjoy the cool mountain air. For backpackers, the best way to go north is via bus. Our destination was Banaue [Lonely Planet|Wikipedia] and the bus ticket costs ps450 per person. Since it is an 8-hour bus ride from Manila, the best time to travel would be at night as you won’t be eating into your travel time during the day and at the same time you’ll save on hotel fares. The temperature during the day may not be as cold but the chilly wind will cause extreme dryness to the skin so do bring moisturisers. Travelling during the summer (March to May) can also bring about sun burns, so sunscreens will definitely come in handy. Travelling tip: warmer garments would be needed as temperatures can drop really low, especially at night. 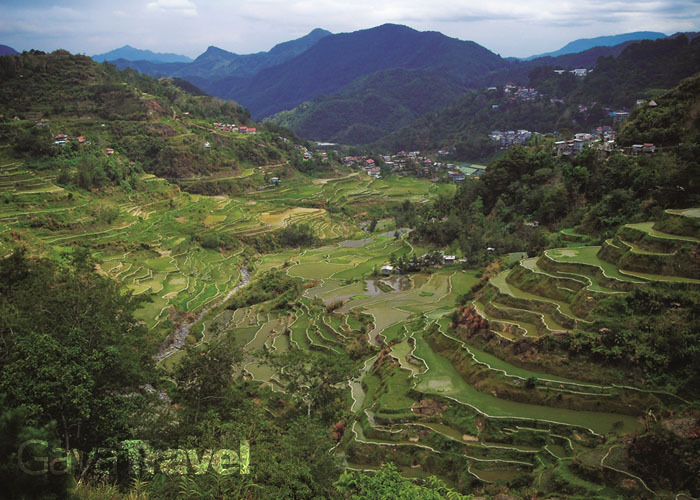 Banaue in northern Luzon is home to the 2,000-year-old Ifugao Rice Terraces that are billed as the eighth wonder of the world, especially since – unlike their seven counterparts – they were built manually by the native Ifugao farmers without slave power. They have also been certified as a UNESCO World Heritage Site. Visitors should trek from one village to the next atop these thin, curvy terrace walls—fall uphill and you’ll land in the mud, fall downhill and you’re in for a long tumble. But don’t let this scare you because the view from the top of the mountains that overlooks the rice terraces is simply amazing. During the summer you’ll see a remarkable stretch of lush greenery while during the rainy season you’ll be treated with the golden views of ripe paddy. Banaue is more backpacker-friendly than Manila so there is an abundance of guesthouses to be found all over town. These guesthouses offer fair rates, but to ensure that you will get your money’s worth, do check out the rooms and the facilities offered at the guesthouses first. Some guesthouses offer free internet or free hot water so scout around to find which guesthouse that suit your needs best. A standard four bed private room with an attached bathroom plus hot water would cost around ps1500.The best way to get around Banaue is to actually hire the services of a local guide. Guide services will cost from ps2400 – ps3000 depending on how many places you plan to visit and how good you are at haggling. These charges include tips. However, the basic guide package that includes transportation, visiting the rice terraces, including the trip to the Hiwang native village is enough to take up a whole day. Another attraction that can be included in the package is the Batad Waterfalls. However, going to Batad would mean staying there overnight and for budget conscious travellers, this definitely would add onto their expenses. Jeepneys are the preferred mode of transport when visiting the rice terraces as it involves travelling on dirt road up the mountainside. For the more adventurous travellers, there is also the option of hiring the motorcycle taxi; however, this is not advisable as the rough roads can be pretty hazardous. With the jeepney, you’ll be able to enjoy the view of the mountainside but at the same time you’ll enjoy it from the safety of the jeepney. Another upside of travelling with the jeepney is that you’ll have the option of enjoying the mountain view from the vehicle. The jeepneys have been modified in such a way that it can safely transport passengers on the roof. believe it or not, travelling through the mountains on the roof of a jeepney is an experience not to be missed. Travelling with the jeepney is only half of the Banaue experience – the other half involves hiking. The hike is mostly on level ground but there is a certain amount of climbing involved so it is best to be fully prepared with hiking shoes / sandals plus a bottle of water. 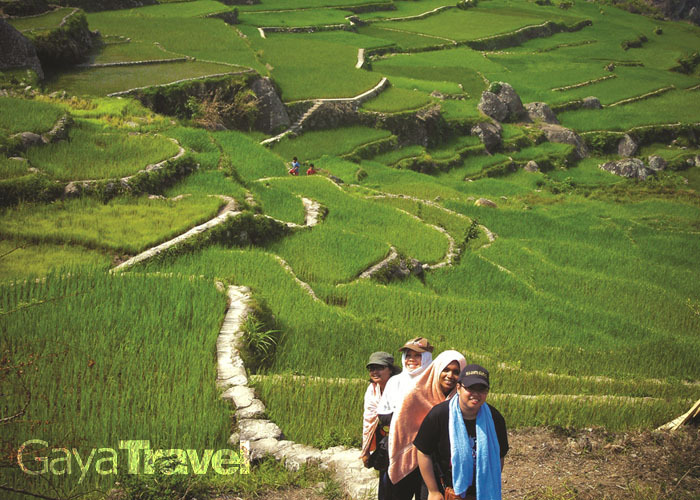 A two-hour hike may sound a little scary to many but the experience of hiking through the rice terraces is simply surreal as you realise that you are surrounded by a 2000 years old tradition that has stood the test of time. You’ll be so busy admiring the view and enjoying the crisp mountain air that before you know it, the two hour hike would be over. Plus halfway through the hike you will have an opportunity to cool off at the Hapao river. The clear, icy cold water will freshen up any exhausted traveler in no time. 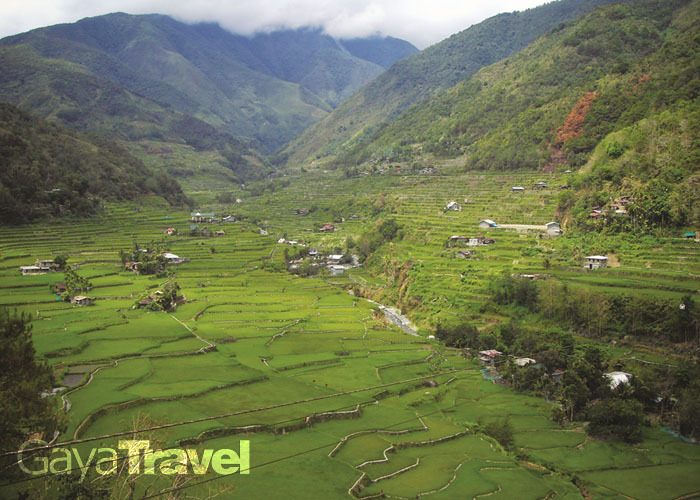 Sagada [Lonely Planet|Wikipedia], which is three hours drive away from Banaue, is nestled in a valley at the upper end of the Malitep tributary of the Chico River, around one and a half kilometers above sea level in central Cordillera; enveloped between the main Cordillera Ranges and the Ilocos Range. 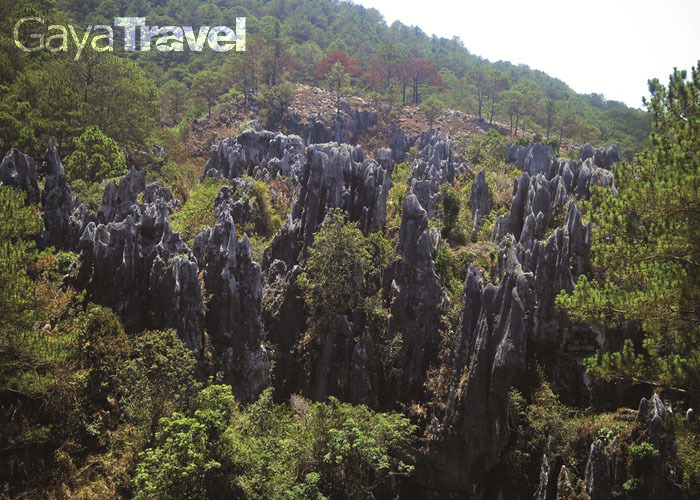 Sagada is famous for its natural beauty, ancient culture and their people, the Igorots. 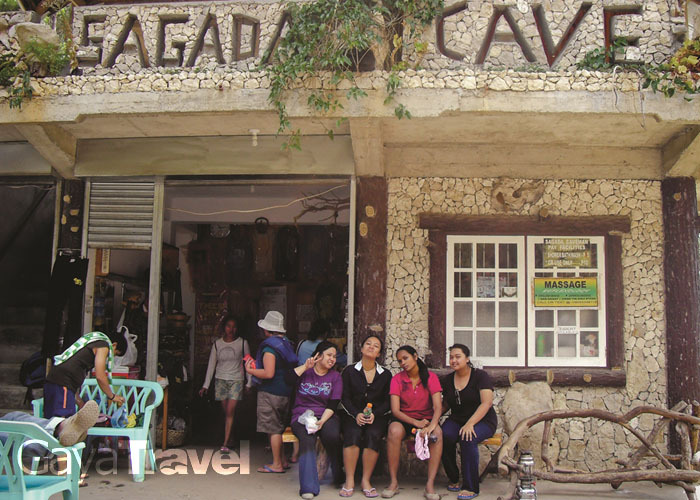 Tourists from all over the world especially visit Sagada to try their hand at exploring the three natural caves: Lumiang, Sumaging and Balangagan. Lonely Planet dubbed Sumaging Cave as one of the best adventure travel destinations in 2009. Cave exploring or spelunking has become such a major source of income that the locals have decided to come up with an organisation in order to standardise the rates for guides and tour packages. 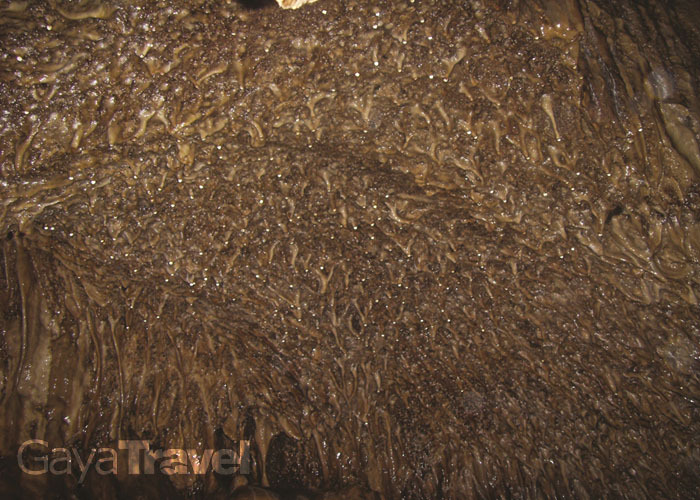 All visitors intending to go spelunking should contact the Sagada Guides Associaton (SAGGAS) to hire the services of a trained and experienced guide. 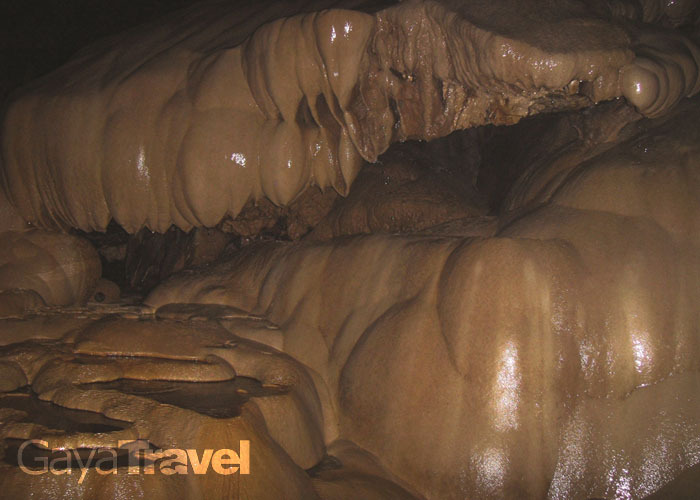 Visitors planning to visit the Sagada caves and need further information, including SAGGAS contact number should visit their official blog. The blog lists down all the information that you possibly need for an activity filled vacation. Spelunking tour packages and their rates are also listed here, making budgeting a lot easier. Lonely Planet dubbed Sumaging Cave as one of the best adventure travel destinations in 2009. The two spelunking packages available are categorized based on their level of difficulty. Inexperienced spelunkers should opt for the easy route that covers the Lumiang cave and the Sumaging Cave. This tour package will take around 2 hours and involves a lot of climbing, wading through underwater streams, crawling around in dirt and even rolling around in guano (bat droppings). But all the aches and pains will disappear as soon as you see the beautiful natural rock formations found in the caves. For the more experienced and adventurous spelunkers, they can always opt for the Cave Connection tour which could take up to 4 or 5 hours. This package involves spelunkers going through an underwater pass from Lumiang into Sumaging and there are at least three rope assisted descents and one climb. This underwater pass is a true test of endurance as spelunkers will need to find their way around in the dark, neck deep in the water. During the rainy season visitors are required to swim 8 meters in order to cross the trail. The packages offered by SAGGAS is designed with the visitors’ safety in mind and all the guides are especially trained to deal with any safety issues that may arise during the tour. So no matter how experienced you may be at cave exploring, it is best to enter the caves under the care of a guide. Other than the obvious safety issues, guides are also there to ensure that no visitor would breach any rules of conduct when visiting the sacred caves. No matter which trail you take, surviving the descent into the caves is an accomplishment in its own. For an additional ps20 the guides will prepare a certificate of accomplishment as a testament to your victory over the elements. 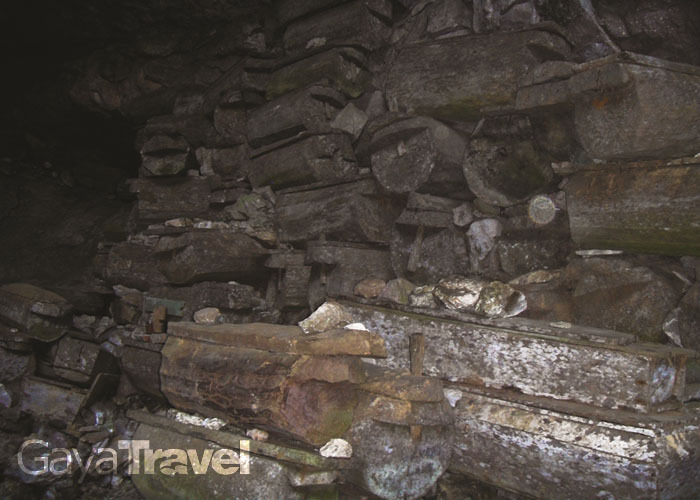 Sagada is also famous for its hanging coffins. It is an ancient burial ritual that dates back thousands of years. In this ritual the deceased is either tied seated on a chair-like contrivance or placed in a coffin which is then hung unto the mountain wall. The belief is that the higher the coffin is hung, the easier it is for the souls of the deceased to reach the heavens. 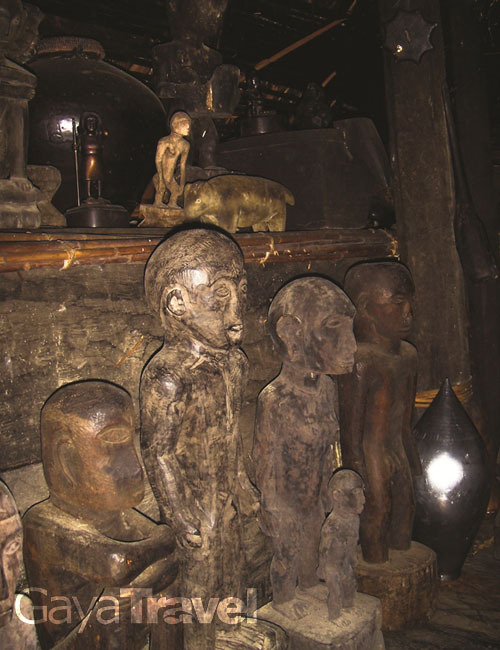 This ritual is a primitive practice that later on led to the deceased bodies being put in coffins and placed in burial caves such as the Lumiang Cave. But after the arrival of Christianity, this practice is now slowly fading away. The two main sites for the hanging coffins are the Sugong mountainside and Echo Valley. Echo Valley literally got its name from the loud echoes bouncing off the valley walls. But the older Igorots sometimes refer to the valley as Paytokan (jump place). This is actually a direct reference to the steep cliff overlooking the valley. A short climb down the cliff will lead you to another burial site. Echo Valley is an easy 10-minute walk from the town center that will lead right pass the beautiful St. Mary’s Church. If you’re unsure of the way, there’ll always be local boys from the orphanage who would be more than happy to show you the way – at a small fee, of course. A word of caution to the faint-hearted: though the trail requires you to cut through a Christian cemetery that can be rather creepy, calm yourself down by watching the local teenagers playing at the basketball court with a delicious cup of Halo Halo sold all along the Sagada roadside. 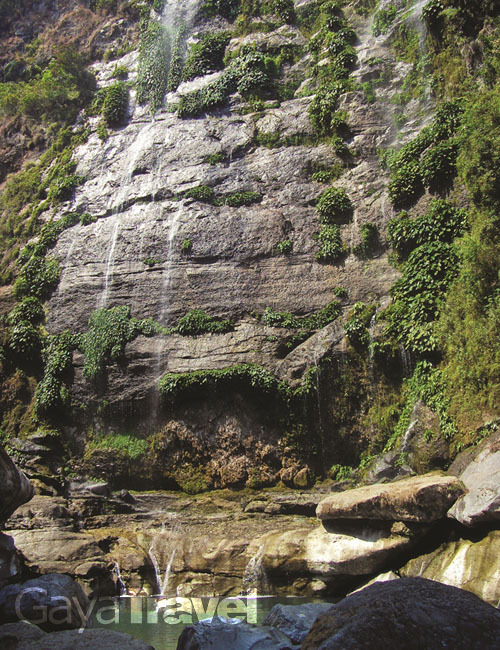 The Bomod-ok waterfalls is also a must see site in Sagada. A tour package to Bomod-ok, which costs ps1250, includes a jeepney ride to the village of Fidelisan and a guide to the falls. The falls is an hour trek from Fidelisan; however, as the route towards the falls cuts through the Aguid rice terraces and a nearby village, the time seems to fly by in no time. Just remember to bring extra clothing and some food if you enjoy picnics by the waterfalls. Bokong falls or the small falls is one of the nearest sights of the tour. It’s a 30-minute walk from the town center and another 7 minutes to travel with vehicle from the municipal hall. The main allure of Bokong is not really the falls but instead it is the 12 feet deep natural pool. Bokong is also famous for its barbecue and picnic site. During our visit to Bokong, we were lucky to bump into a group of visitors from Boracay who were picnicking at the site who invited us to join them for a Filipino style barbecue meal with marinated rice cooked from the famous rice terraces. Surrounded by amazing company and great food, the picnic rivalled any 5-star dining experience anytime. Picnics are not the only dining experience available in Sagada. If it is local cuisine that you crave, then seek out the famous Pinikpikaan, slow roasted chicken roasted to perfection. If your palate is geared towards western dishes, then the Yoghurt House and the Lemon Pie House is worth checking out. The Yoghurt House is famous for its thick handmade yoghurt and pasta dishes while the Lemon Pie House specialises in homemade pies. A variety of filling is sold there but it is the pies with lemon filling that keep people coming back for more. However, the best Sagada dining experience would be a meal by the bonfire. Bonfires are usually an on-demand activity catered for large parties. The SAGGAS guides were kind enough to plan a bonfire for us and even went out of their way to dress up in traditional Igorot native wear. After dinner activity is also an event to look forward to as the guides entertained the guests by demonstrating traditional Igorot dance, accompanied by brass drums and gongs, which guests are even invited to join. Bonfires can last long into the night and despite the drop in temperature, the heat of the fire and all the dancing definitely warmed everybody up. But bundling up in warm clothes is still recommended. The bonfire party is the pretty much the only nightlife you can find in Sagada as the town enforces a strict 8.30 p.m. curfew, which requires all businesses to close and town folks to respect the peace and quiet of the night. Bonfires therefore are normally organised at a remote place away from the town. 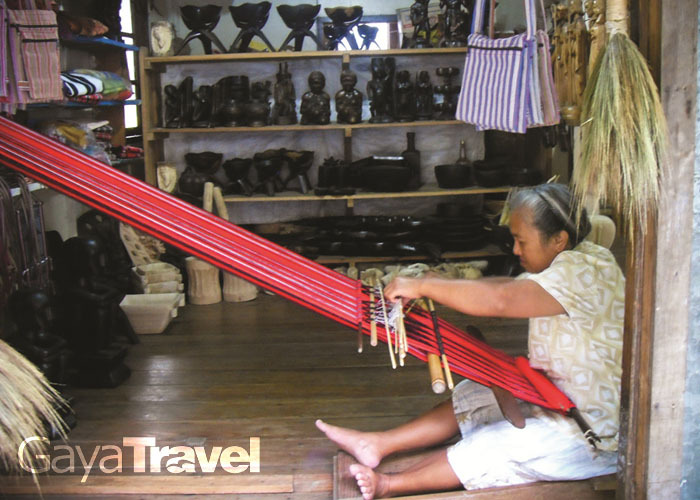 If Banaue is famous for its rice terraces and wood carvings, then Sagada is well known for its weaving, which is the basis of the traditional Igorot native wear but now adapted to include bags, wallets and home accessories. Modern technology has made weaving a lot easier. However, the traditional art of manual weaving is still not lost as you can still see ladies hard at work on their weaving, which can serve as perfect souvenirs for friends and families back home. After 10 days in Luzon, we still barely scratched the surface of the island’s culture and its people. Despite fully immersing ourselves with the local customs and activities, Luzon still beckons all of us to return. And we all have vowed that this will not be the last of us visiting the Philippines.